It’s confession time: I don’t like soup. I can probably count on one hand the times in my life where I’ve truly enjoyed a bowl of soup. In its heyday, Courtenay’s Old House Restaurant made an incredibly creamy clam chowder and I once had a crab bisque at Nanaimo’s Acme Food Co. that I’ll probably never forget. 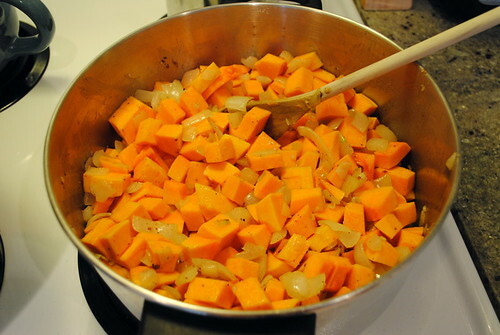 However, one soup that I can rarely turn down is butternut squash. With its earthy texture and hearty flavour, it instantly invokes that warmth you only feel in the autumn. 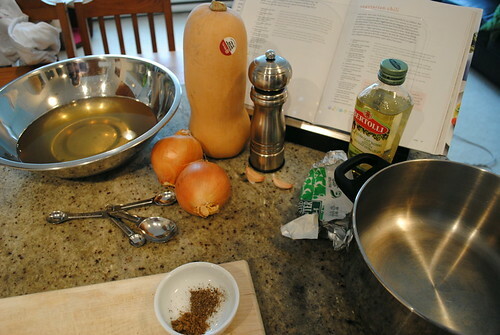 Last week I followed Gwyneth’s recipe for vegetable stock, a key ingredient in her butternut squash soup recipe. While I couldn’t wait to make my own, the notion of working with a fresh, raw gourd intimidated me. How was I supposed to get all the good stuff out of the butternut squash and shed only the peel? 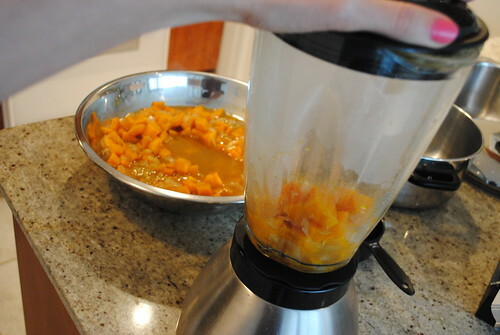 As I quickly found out, butternut squash is quite easy to work with. 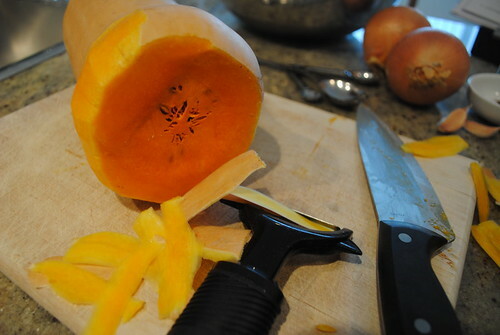 Start by using a sharp knife and carefully slice off each end of the gourd – about 1″ will do. Using a standard vegetable peeler, peel away what you don’t need. 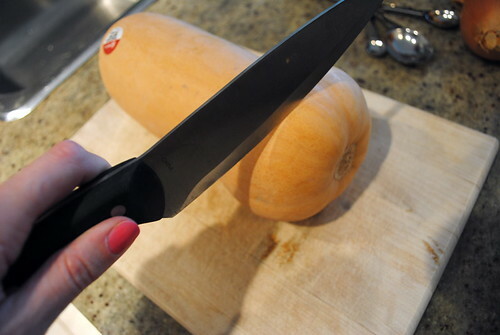 This will make the squash easy to slice in half. 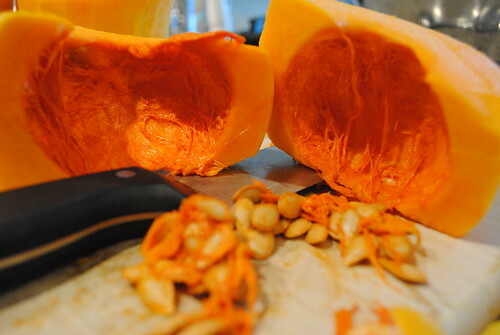 The inside of a butternut squash is not much different than the inside of its cousin, the pumpkin. Gently scrape away the clingy webs and seeds using a spoon. 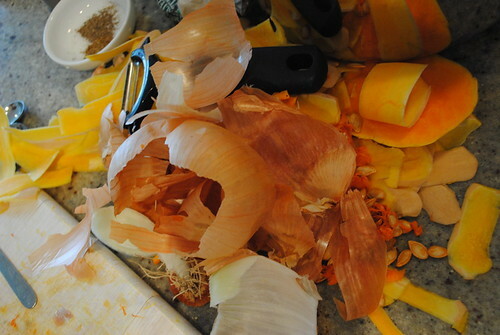 Once the butternut squash is peeled and gutted, chopping is a breeze. When making a recipe with many ingredients that require preparation, I like to get all of the chopping done before I even turn on the stove. 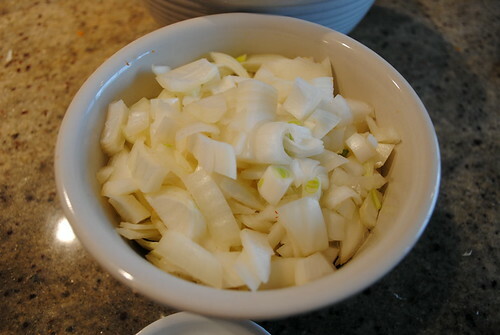 The onions alone took me nearly 20 minutes to slice and dice! As a kid, I foolishly thought wearing my swim goggles would prevent the tears. Little did I realize that it was the inhaling of the onions that caused the tears. Now I take lots of breaks and stick my head out of the window to breathe. 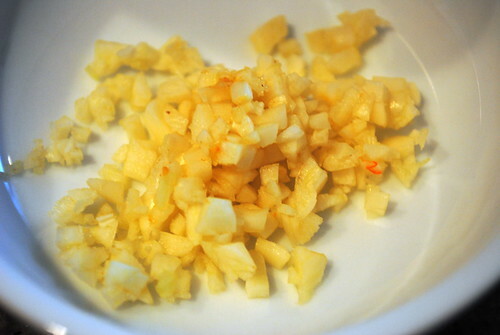 Once the vegetables and garlic were chopped, I slowly sautéed the onions and garlic in the biggest pot in my kitchen. I’ve learned that keeping the heat lower and allowing more time to sautée will prevent burning. 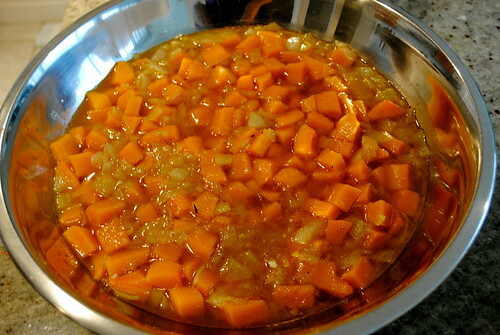 After cooking down the vegetables they’re bathed in warmed up vegetable stock for about 20 minutes. 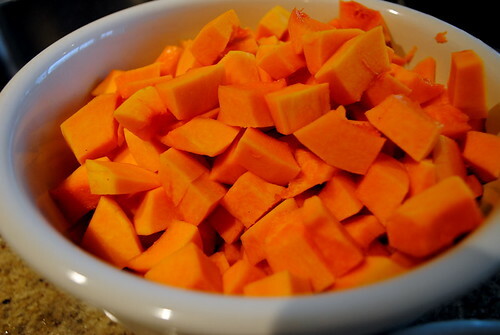 This allows the softened butternut squash to absorb more flavour. 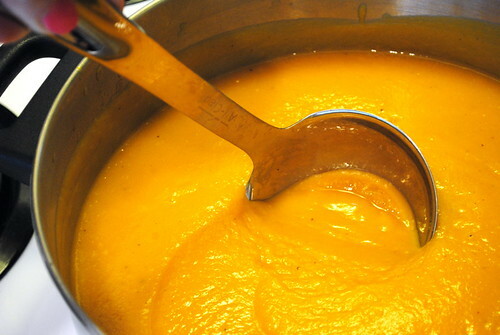 The next step involves blending to get that smooth, creamy texture that butternut squash soup is famous for. 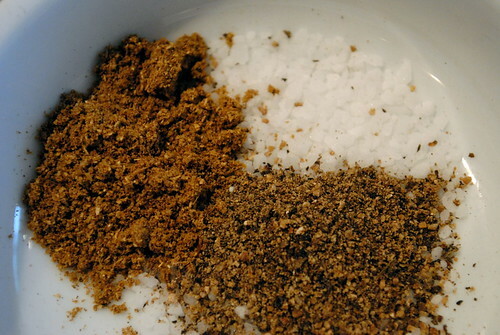 Because the ingredients are hot, G’s tip is to work in small batches and work slowly. 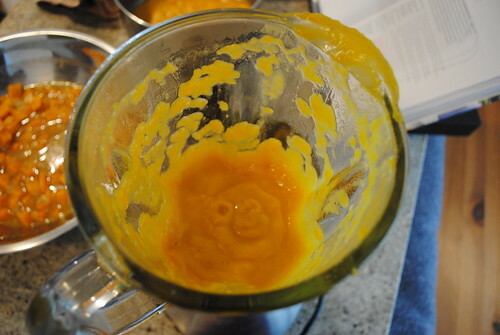 The piping steam can cause the blender’s lid to blow off. 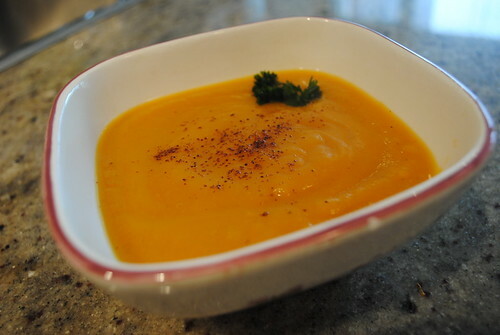 Once everything has been perfectly puréed, re-heat the now finished soup and serve. My favourite garnish is a sprinkle of nutmeg, but a dash of heavy cream or sour cream would be tasty too. This soup was so yummy that I very quickly downed it and ladled myself a second serving – enjoy! Have you ever looked at the back of your soup can and tried to pronounce any of the ingredients? Nothing makes a bowl of soup taste even better than knowing exactly what you’ve put into it. For this and other terrifically healthy recipes, grab your own copy of My Father’s Daughter. You can also now follow G on Twitter! Looks great! Care to share the recipe? I am now craving soup! Thanks, Ashley. When I first started this project, I vowed not to share the actual recipes as I don’t feel it would be ethical to do so – much like downloading movies or burning CDs. However, the cookbook is filled with delicious recipes and I feel it’s well worth the money. everyone hates her and i sort of do but not as much as i LOVE HER. you know?